This was the last Mendes film I had to see to complete his filmography; I’ve also completed Cuaron and Jeunet’s filmography in the last month. So when I watch this film, I can’t help but measure it against the other successes and failures of his career, though I’m quite a fan of him so I use failures only in the most liberal sense as I don’t think he’s made anything less than “good”. 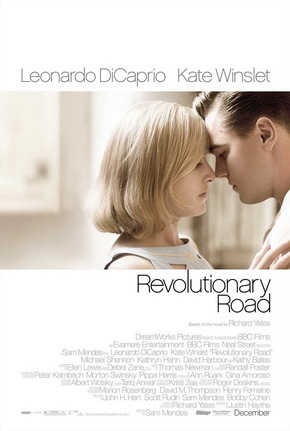 Revolutionary Road falls right in the middle for me, better than the cute but unambitious Away We go and the ambitious but somewhat unsatisfying Jarhead, while not quite matching up to the lofty heights of American Beauty and Road to Perdition (which despite all the violence and robbery, is actually his less dour “Road” film). My problems, though somewhat slight in the grand scheme of developing a motion picture, prevented me from being fully engaged what was presented on screen. I suppose my biggest issue was how the dialogue was very on the nose. There was little room for subtlety and it wears its themes on its sleeve. The conversations and arguments began to be a bit repetitive, and though this is often accurate as to “real life”, where people who don’t face their issues end up in an endless loop of the same fights over and over, it doesn’t make for the most fascinating of story telling. The problem is exacerbated on account of a brilliant little show called Mad Men being around and doing many of these themes with a subtlety, intelligence, and class that this film doesn’t match. My other major issue is the sheer pessimism of the film. It’s obvious that the film seeks to destroy the illusion of romanticism but the depiction of relationships is of such an extreme negative degree, it is as though the filmmakers forgot to include why people even bother with them in the first place. Everyone either fights endlessly or has to find ways to cope with how much they can’t stand each other, with rarely a scene of marital happiness. Perhaps I am naive, but it seems a bit disingenuous to me. It would be as if Eternal Sunshine lacked the bits where we see even a bad relationship had good bits. I can’t recall that ever happening here. It’s pure misery through and through and the only other film I can think of that is like this, is probably Dancer in the Dark, but that tackled more serious dark themes that would warrant pessimism (exploitation of foreigners, corrupt justice systems, etc). This just feels like the venting of someone just out of a terrible relationship. All that said, the film is strikingly well made. Deakins provides his ever great cinematography, DiCaprio and Winslett are uniformally awesome with DiCaprio giving one of his best performances ever, and Michael Shannon manages to steal the show with just a few brief scenes by turning what could have been a mess of a caricature into an intriguing powerhouse that is both amusing and unnerving all at once. Despite the repetitive nature of the film, it is rarely boring and it is interesting to see the two feed off each other. It is also less than predictable, where I was uncertain as to how the film would resolve or not resolve its issues. And somehow, despite all those issues I had, it has stuck with me. I have thought about it all day which, while not altogether a rarity as I try to watch many great films, is a sign of quality.